Traditional Chinese Medicine claims sleep to be the least expensive and most widely available method of staying healthy, one that also promotes longevity. Western medicine appreciates the value of sleep as well and recognises it as a basic requirement of the human body. It is crucial for the health of both body and mind. Sleep regenerates the body, hence its deficiencies have a negative impact on our mood and look. One of the main functions of sleep is ”turning off” the activity of the central nervous system. During this commences its ”restoration”, i.e. the brain repairs any ”damage” as well as memorises new information. This implies sleep cleanses the brain, and during various biochemical mechanisms, which are responsible for long-term memory. Sleep also affects the function of the immune system and the secretion of certain hormones, e.g. growth hormone. According to Traditional Chinese Medicine, toxins are eliminated during sleep through the action of the lymphatic system, liver, lungs and the large intestine. Each of the elimination stages occurs between 9 pm and 7 am - in two-hour cycles, it is therefore important that sleep is not disturbed during this period. Otherwise, the toxins will not be fully eliminated, and this will reflect on how we feel. TIENS Health Pillow, based on the Traditional Chinese Medicine, is shaped especially to provide ideal support for the cervical spine. It is made of light and soft pearl wool that keeps it in proper shape. Because of the wool’s elastic properties, the pillow offers strong support to the neck, while putting less pressure on the cervical vertebrae and such prevents gravity-caused neck strain during sleep. Thanks to a combination of a magnetic field, infrared light and negative ions the pillow supports the proper function of the cells in the body and improves their oxygenation. Sleeping with TIENS Health Pillow may help balance the biological magnetic field of the human body, relieve fatigue, improve the length and quality of sleep. Antibacterial fabric – a clean sleeping environment without mites. 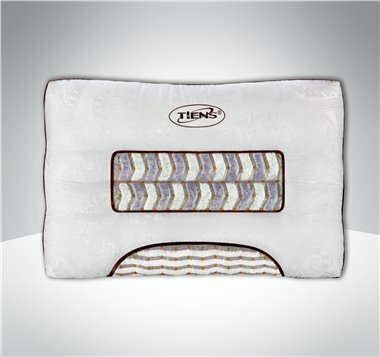 TIENS Health Pillow is made of tourmaline antibacterial fabric, which has passed the accreditation inspection of SGS authentication. It can effectively restrain the growth of bacteria and is free of formaldehyde. Jade - help to calm and soothe nerves. Jade can stimulate the nerve points and providing rest for brain cells. It calms and soothes the nerves. Amethystine - a natural sedative. The natural amethystine can facilitate the activating of collateral channels and help in case of insomnia and improve sleep quality. Far infrared negative ion and TIENS Energy Stars at the neck position. The far infrared ray has the function of promoting blood circulation, get through the microcirculation and accelerating the regeneration of cells and relieve the neck discomfort. The negative ion has a bactericidal function, kills mites, clears the air, helps balance circulation, removes fatigue, relaxes the muscle of neck and shoulders. Particle network - breathable and hypoallergenic fabric. The particle network is knitted with colourful high-strength polyester yarns, the mesh has uniform density and is hypoallergenic for skins. The fabric has high air permeability. At the same time, combined with the embroidery technique, the product looks very nice and is useful. EPE foam (Pearl wool) - lightweight and resistant to shock. Pearl wool is light, soft and with good buffer performance, which can add the neck’s supporting strength, thus can ease the pressure to the neck, then reduce the neck been hurt from gravity during sleep.